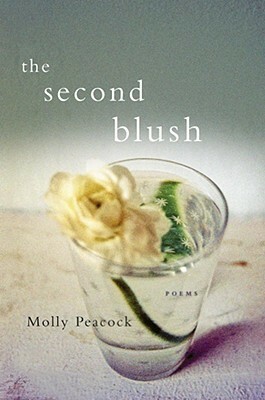 Here I have two recent reads by Molly Peacock, an American born poet who lives in Toronto & counts herself as half Canadian as well. I've read her book about poetry previously (How to Read a Poem & Start a Poetry Circle); now I'm getting to some of her actual poetry. So as I mentioned, I haven't read much of Molly Peacock's poetry before. This collection is about domesticity, about her life with her husband, and the role of love in shaping our lives. It's very readable, 'poetry' in the sense that most new readers would recognize. She uses a lot of end rhyme, with short poems describing moments that are easily grasped. Yet they aren't simple, exactly. I found many of them evocative of emotion, of daily living, in an understated but resonant way. "Happy Diary", a list of things that have made the poet happy, complete with rhyme, is obvious but still lovely. And she takes basic activities like doing dishes, having a picnic, or going to yoga and turns them into poetry. I liked this collection; it's set out in four sections and each has a certain feel to it. She is talking to the reader, inviting them into her poems, and it gives the book a warm and welcoming feel. I found that one, "The Flaw", was a favourite, as she used textiles as a metaphor, which I can really appreciate. And one called "Warrior Pose", about yoga class, has a few lines in it that struck me in our current climate. surprised face with lunging beauty. You can read some of the poems from this volume at her website (and listen to her read one) -- including my favourite, The Flaw. Toronto: McLelland & Stewart, c2014. The charm of this book lies heavily in its gorgeous collage illustrations done by Vancouver's Kara Kosaka - you can see them all at her website. They are simply beautiful. In its alphabetic focus, size and art, this book recalls two other titles that might be of similar interest to readers: Diane Schoemperlen's recent By the Book, and the non-illustrated but very brief & moving The End of the Alphabet by C.S. Richardson, which to me has the same quirky, intellectual tone. 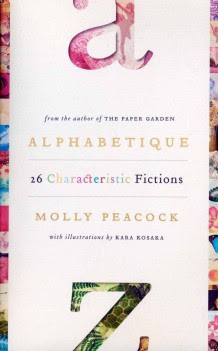 In this book, Peacock posits a life and existence for each letter of our alphabet. And in each brief tale, the letter lives a little. With a lot of alliteration. I could continue, it's curiously catching. It's a mannered and clever structure, depending on wordplay and archness in the storytelling. The idea shapes the content. It's amusing, but don't read them all together at once; space out the stories so you don't get overwhelmed by the conceit and can enjoy each tale separately. I found that I had to take a little break from it after a few letters, and then just kept picking it up to read one or two more in between other books. That worked well. I enjoyed some letters more than others, of course, and I also liked how previous stories worked their way into later ones. I thought it was interesting and intellectually satisfying, but the beautiful images are really what have stuck with me. It's a small volume, with both images and words giving a bit of a dreamy feel to the reading experience. Two lovely reviews, are better than one! Both of these collections sound delightful. The poem IS perfect for right now, indeed. (And, coincidentally, I've been really working hard on my yoga practice to try to boost these qualities to better cope with all the rest of it.) I'm also with you on the not-all-at-once suggestion for Alphabetique; they're charming, but it's easy to get overwhelmed if you press on too far in one sitting.